I am happy to report that both hives are installed, the queens are both alive, there are pollen and nectar stores building up and both hives are growing in number! All the exciting bee things are happening in those magical hives, and we were able to capture some of it in photos. Sounds like bee business as usual, but I do not take these happenings for granted! You see, after I took the requisite course on beekeeping, I was terrified. Not of being around thousand of bees, but of varroa mites, bees absconding, a poor laying queen, my bees swarming, wax moths and more! You learn pretty quickly that keeping bees isn’t a hands-off hobby! 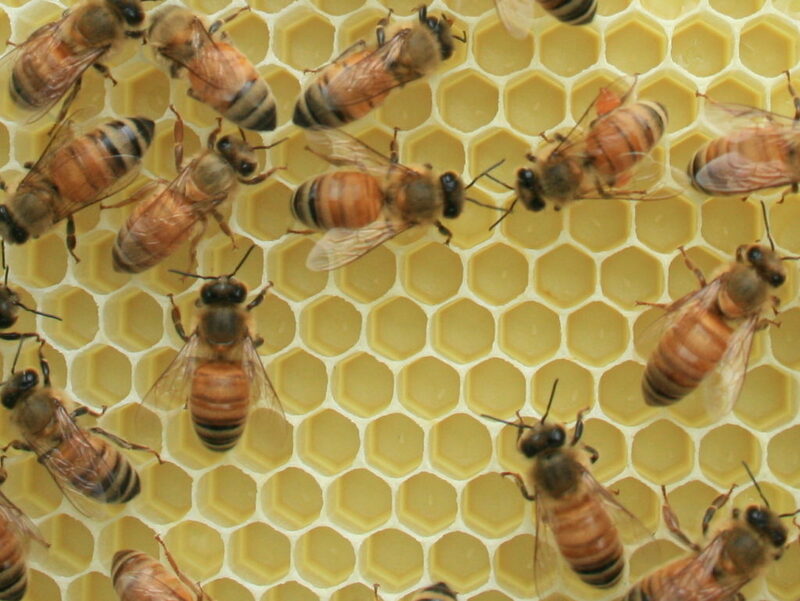 It has been widely publicized that honey bees are in decline. Before my class, I thought it was so obvious that of course bees will get sick if our fields are going to be sprayed with toxic chemicals! While I firmly believe this is a terrible practice, I now realize that my bees don’t necessarily stand a better chance just because I am housing them in an organically managed yard. A lot of things can go wrong, and being a newbie to bee behavior, I was…unsure, to put it mildly. Ok, so in full disclosure, and to my great embarrassment, I am going to give you an idea of how deep my beekeeping insecurities ran. After a beekeeper installs a new package of bees in the hive, you let the bees get settled and do there thing, not just for the rest of the day, but for days. Oh it takes patience! 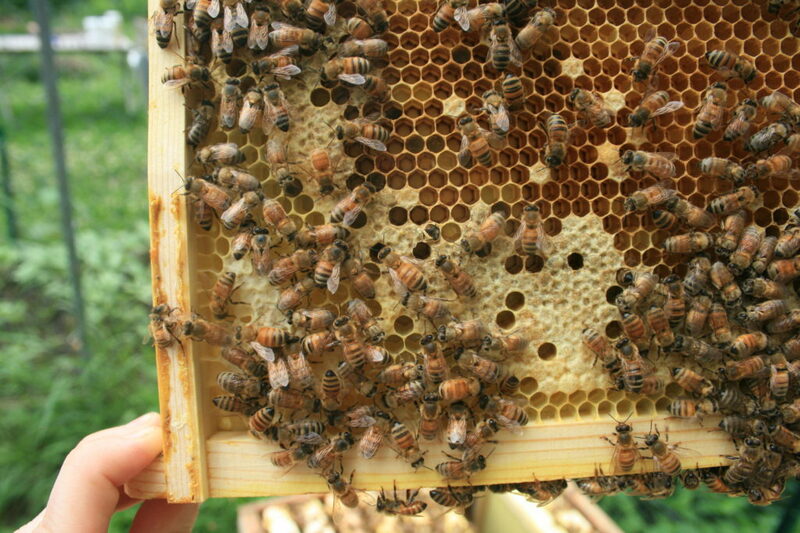 After about a week, we were able to open up the hive to make sure the queen was there, healthy, laying eggs. We had hands-on inspection experience in class, and I thought I knew what to look for. 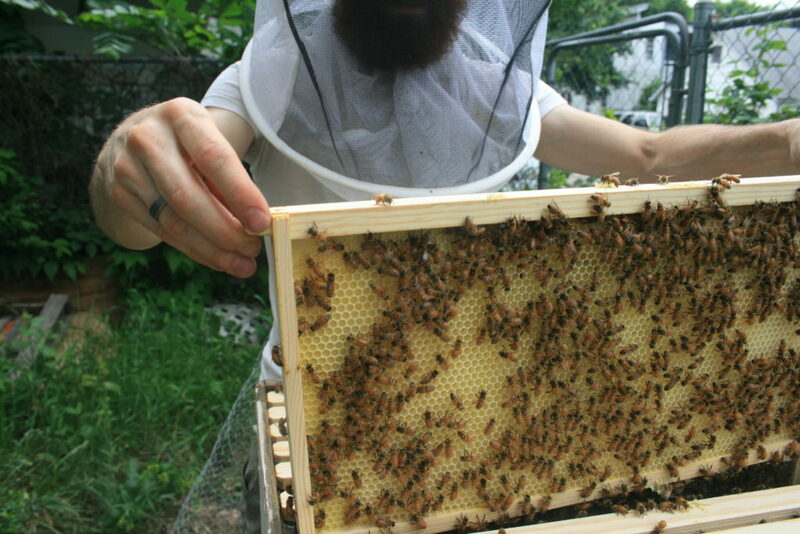 But when we opened up the first hive and looked around, my heart sank. Still, we moved on to the next hive and I was frantic with disbelief! Both queens were present, we saw them, but neither was laying eggs! There she is! Isn’t she a beaut?! Oh no! It seemed unreal that both could be bad queens, I must be doing something wrong! So when my apiary visit got cut short by a crying baby, I took the occasion to promptly email my teacher to explain the problem. Meanwhile, cool, calm and collected husband solved the problem and spotted several eggs in the hive, but not before my embarrassing email was sent. You see, I hadn’t factored in that when we did our first inspection in class, the packages were further along than mine was at that point. So while my hives didn’t have all the larva and capped brood that I saw in class (the stages that follow the egg stage), there were indeed eggs. Folks, these bee eggs are TINY, so, so tiny and very difficult to spot. The eggs, much smaller than a grain of rice, sit at the very bottom of a cell, white against the off-white color of fresh beeswax. To make things more complicated, my bee veil of black mesh made my vision choppy, worse than looking through a dirty window screen. See if you can spot an egg. Lucky for you, I’ll zoom in the photo, and won’t force you to put on a black veil. Alas, it was humbling, to say the least. I’ve now learned that it never serves a beekeeper well to be hasty. Here are more photos capturing our bees’ activities! 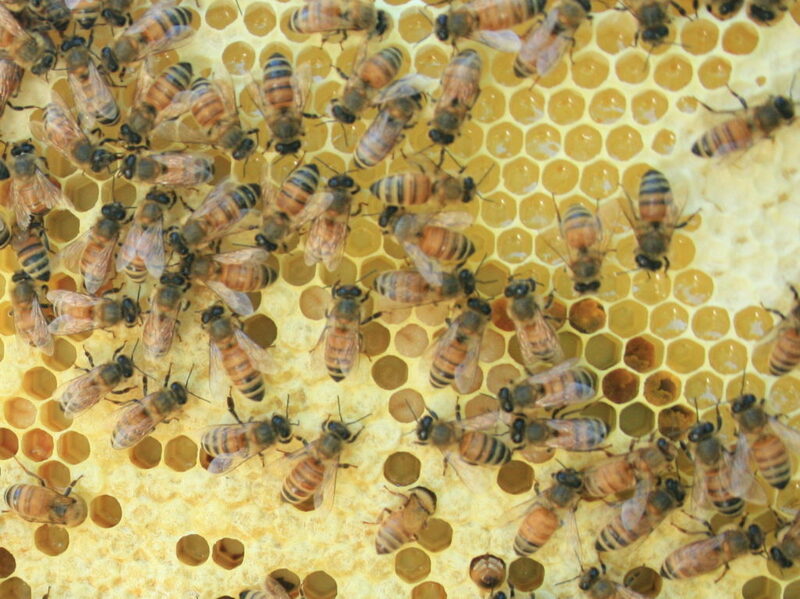 In the center of this photo, you can see a brand new bee emerging. They must chew their way through the wax capping when they are fully developed. Then they immediately get to work cleaning out the cell they just came out of so that the queen can re-use it for a new egg! Look at those pollen baskets! 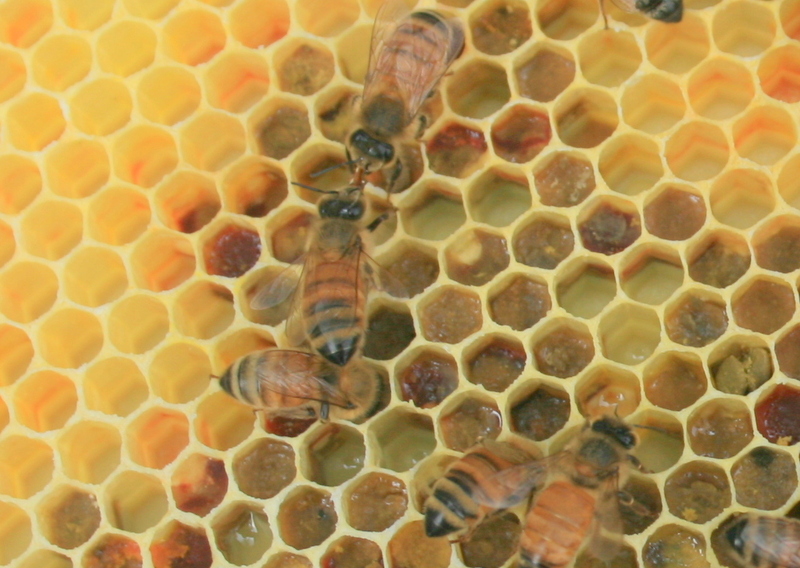 Bees have bags on their hind legs that they pack full with pollen, then return to the hive to unload. 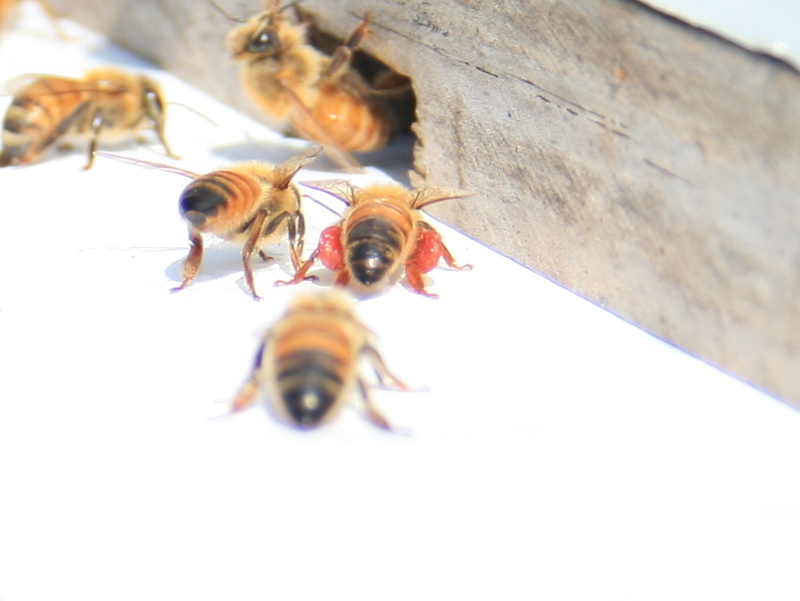 When our bees first started collecting pollen, there was a lot of red pollen coming in. How beautiful! 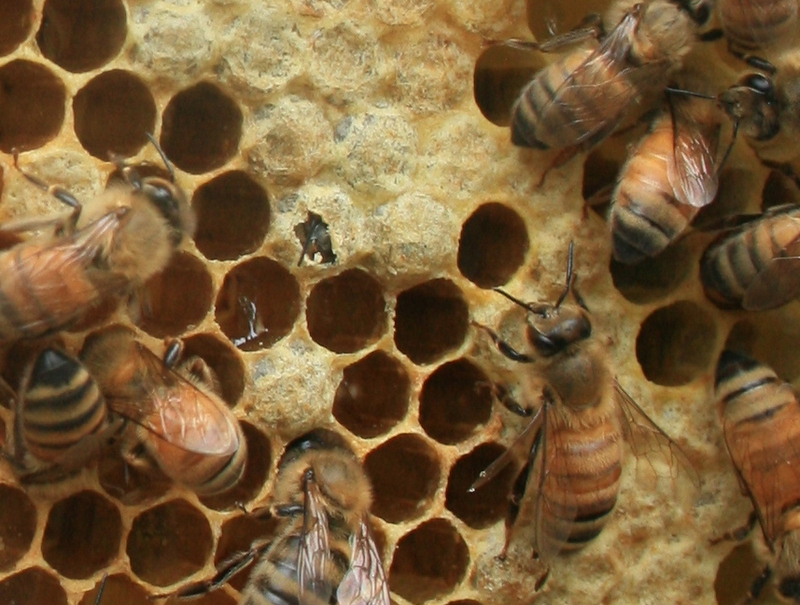 The bee egg develops into larva, seen in the center of this photo. 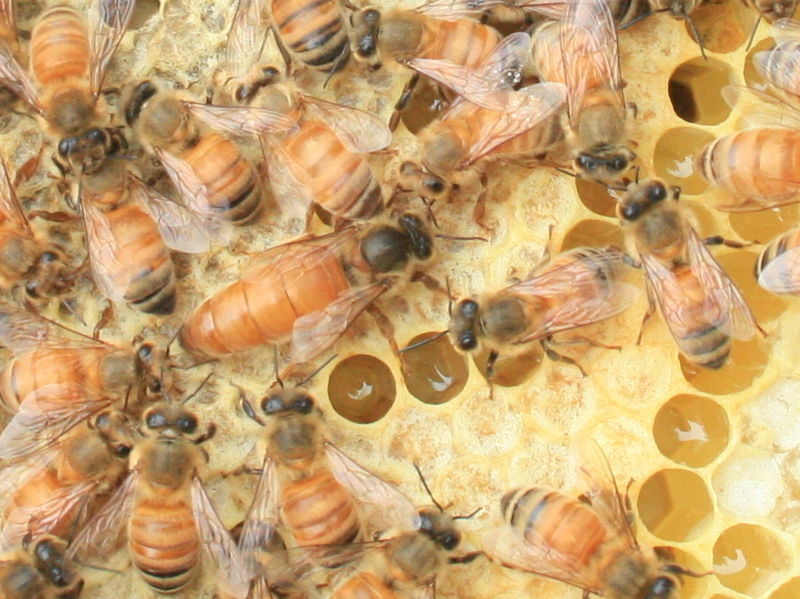 The larva then receives a wax capping until the bee is fully developed, called capped brood, and pictured to the lower left. Nectar and capped honey can be seen in the upper right of the photo. Busy bee frames! I could watch bees for hours! They are really an incredible organism! If you are curious to learn more, or just have an appetite for anything bee, check out this fantastic 80s film by Phil Simon – The Mysterious Bee. If you would like to get into the details and perhaps keep bees yourself, I recommend starting with Dean Stiglitz and Laurie Herboldsheimer’s The Complete Idiot’s Guide to Beekeeping . If you have bee adventures or photos, please do share! Wow! Having our own bees is on the agenda once we make the move out to the farm! I can’t wait! Good luck! I haven’t harvested any honey yet, and it is already a rewarding hobby!